While a regularly updated blog is a key part of an effective online marketing strategy, a lot of businesses fall at the first hurdle. They struggle to come up with new ideas for blog content, and because of that never really get going and consequently miss out on all that blogging has to offer for their business. Support for social media activities and other forms of content distribution – you have regular content to share or repurpose into other forms and distribute elsewhere. You build links and traffic, as well as build visibility, authority and credibility. Improved sales and lead generation – your blog content attracts your market to you through different channels, which you can convert into leads for your business and monetize. Did you know content marketing generates 3 times as many leads as other types of marketing, while costing 62% less (DemandMetric)? (Want three more? Here are 6 big benefits you get from blogging as a business). However, without the regular supply of blog content ideas, none of the above is achievable. The good news is that generating new ideas for your blog is a skill like any other, and is easy when you know how. So here are 57 different ways to generate engaging ideas for new content for your blog — or indeed any other type of content to attract your marketplace to your business. Get the checklist with 57 ways to generate ideas for new content. 1. Expand on previous list-style posts. Where you have previous list-style posts (like this one) on your blog, the different points can often be expanded into their own standalone posts where you go into more depth on the topic. 2. Read industry magazines for inspiration. Subscribe and read industry magazines. This can inspire a lot of new ideas for content, as well as boost your own expertise. Grab a free account on Scoop.it and subscribe to the topics you’re interested in. You’ll get a daily email with the top stories related to your niche, which can quickly give you ideas for your own content. 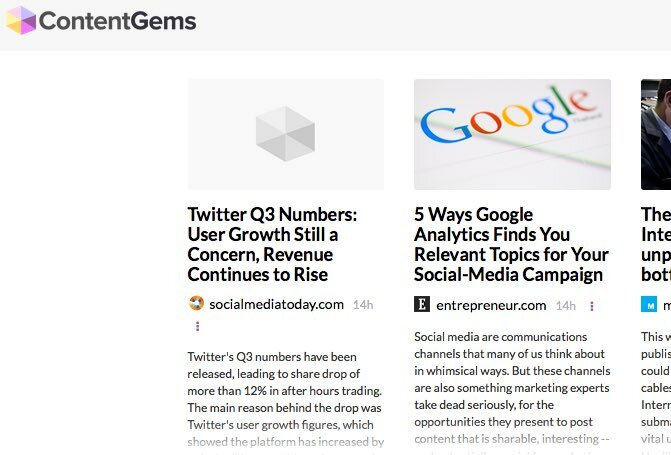 ContentGems is another site that can provide a daily supply of new content related to your niche, and inspire your own content. Curate content from others and share with your own marketplace. This has a number of benefits, not least by actually reading the content (as well as comments) you get a ton of ideas for your own content. 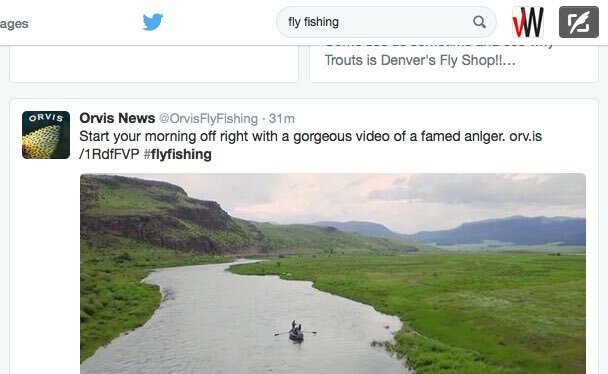 Search Twitter for words or hashtags related to your own niche. You may get ideas from the Twitter feed itself or by clicking through on some of the links provided. 7. Follow thought leaders and influencers. Subscribe to relevant ezines and social media channels for thought leaders in your niche. Use their content to help inspire your own. Use Quora to discover the type of questions people in your marketplace are asking. What do they want to know? What problems are they facing? What do they need solutions for? Quora gives you a valuable insight into the actual questions people are asking, and can be an instant source of new ideas. For more information on using Quora for business purposes, see our complete guide – click here. Similarly, go to different forums related to your niche and find out the information gaps that your content could help fill. When you approach it in the right way and ensure you are primarily giving value directly to these communities, you can also often link back to your own content on occasion. The best ideas for new content often come when you least expect it. Just be sure you have a way to record these often fleeting ideas when they occur so you don’t lose them. For most people, the easiest way is via a smartphone. Ensuring you record these ideas also tends to encourage your subconscious into an increasing flow of new ideas. So while it can seem counter-intuitive … mow the grass, walk the dog, go fly a kite, have a bath. See what ideas occur when you’re focusing on something different. 11. Go to conferences and seminars related to your industry. Live events can generate a flood of new content ideas, through listening to speakers, and meeting and interacting with others in your industry. Also go to events that people in your market might attend, but that you might not ordinarily go to. This can not only tell you where the information gaps are that you could then fill with content, but also inform you how to engage that market most effectively. What type of questions come in to customer support that could be answered via a blog post? This gives you the additional advantage in future that when a similar question comes in again, you can point the customer or prospect direct to the blog post. You could also add a link to the post in your customer support knowledgebase and help customers and prospects get quicker answers to the questions they might have. 13. Comments on your blog. Similarly, what are people asking on your blog? Often questions can come in that inspire new content, and tells you exactly what people are looking for. By referencing the person who asked the question in that new content, you also help build a sense of community around your content and encourage further engagement and interaction. 14. Comments on your social media channels. Similarly, don’t forget your social media channels. Again, what are people asking or concerned about? What type of content could you create to meet these needs. Also look outside your own social media audiences. What type of conversations are happening within the social media channels of your competitors, and thought leaders and influencers within your niche? There’s no better way to find out what your market is looking for than to simply ask them. Or ask something similar like, What’s your biggest challenge? Send out the survey to your email list and/or over social media. To increase response, add an incentive such as a free download – this is little different to when you offer a lead magnet for new list subscribers. 16. Set up an Ask________.com page. Encourage a regular supply of new content ideas direct from your marketplace, set up an Ask_________.com type website (for example, using your name in the domain name). 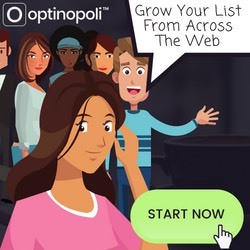 The sole purpose of the site should be to allow people to enter in their #1 burning question, along with their name and email so you can follow up with them and help build your list further. Invite your existing list to the page on an ongoing basis (e.g. via an autoresponder), and share the link periodically via social media. Do some keyword research to find out exactly what information people in your niche are looking for online and asking Google for. Then create content to help them out, and optimize it to maximize search engine visibility. Download our comprehensive guide on How To Do Effective Keyword Research To Optimize Your Content And Attract Your Marketplace – it’s yours FREE. 18. Visit top blogs in your niche. Regularly visit the top blogs in your niche, both for content ideas based on the type of content they produce, and also for inspiration from the comments that people leave. If you see a discussion in the comments you could add value to via a blog post, create the post and then link back to it from the comments to help siphon some traffic across to you. 19. Keep up with current affairs. Can you create content that links in with recent news events? It’s about entering the conversation that’s already going on in people’s heads. As a note of caution, you’re primarily looking to create ‘evergreen’ content for maximum ongoing traffic potential, but you can still create content like this from time to time. 20. National holidays and celebrations. Similarly, what content can you create that links in with national holidays, celebrations and events? Again, this is fine periodically, but the major focus should be on evergreen content that’s relevant all year round. For a powerful insight into the problems, questions and general attitude of your marketplace, offer free advice calls or consultations with customers and prospects. From your conversations, find out what they really want to know and the type of information that can help them. 22. Use a content theme. Can you create a series of posts or other content that all relate to a particular theme? For example, some businesses like to plan their editorial calendar so that each week or month all their content is focused on a particular theme. Try listing down some broad themes that are relevant for the market you are in. For each one, then brainstorm particular aspects of each theme that you could look at in more depth with a post. 23. Look at your existing autoresponder content. By looking at autoresponder content that already goes out to your email subscribers, you might well find information you wrote months ago that could be expanded into suitable content. Once you’ve created the post, and where appropriate, drive more traffic to your post by linking to it from the autoresponder message in question. By encouraging your subscribers to visit your site in this way, it forges a stronger relationship with them and helps build trust and your own level of authority. 24. Do you have any ebooks or other larger pieces of content? Do you have any ebooks, books or reports that have already been created and help support your business? If so, these can be ideal sources of new blog content ideas. Go through them and note down as many ideas for standalone, succinct content pieces as you can. If you already have a blog with some content, look at older posts. Put a new slant on them? Rewrite or update them completely, based on new experience or changing circumstances? Expand certain points within the post (or perhaps the comments) to create standalone posts? For list-style type posts, can you create a similar post but with a longer list and perhaps a shift in focus? For example, this post is largely an expansion of a previous post that also looked at blog content ideas – only this time with more than 5 times as many ideas, and a slightly different slant. 26. See what’s trending on Twitter. Can you create any content relating to trending hashtags on Twitter? Once created, you can join the conversation by tweeting out a link together with the hashtag and potentially benefit from increased exposure. As well as looking on Twitter directly, you can also use sites like trends24.in and hashtag.org for more in-depth, including localized, information. Look on YouTube for popular how-to videos related to your niche. Note down ideas for similar content in a different media, such as a written tutorial that could be published as a blog post. Leave a comment on the relevant YouTube video linking back to your blog post so people can click-through for additional information. 28. Offer guest post opportunities on your blog. Put up a page that invites potential guest posting contributors to your blog. Ask potential contributors to supply three different ideas for possible blog posts they could contribute. You’ll find that some people might have good ideas, but their content is unsuitable in other ways, for example not of the right quality. Their ideas however can help inspire your own future content. For contributors you do accept, if they only create a single post for you, you’ll also have another couple of ideas from them that could similarly inspire your own future posts. Is this approach perhaps a little dishonest? Not really. Remember you’re (a) offering a genuine opportunity for others to gain exposure, and this is simply a side benefit of doing that; and (b) you’re only potentially using their ideas for inspiration – for the better ideas you’d have to go to some lengths to avoid being inspired by them! 29. Go to a bookshop. It’s not all about Amazon! Take some time to actually go to a real bookshop. Find books related to your niche and make notes, e.g. on your smartphone, of any ideas that might be suitable. 30. Create regular types of posts. Case studies where they show problems and how those were resolved, using e.g. customer examples, real data, etc. Similar to tying in with current affairs and news events as mentioned above, are there anniversaries of major events related to your niche coming up that you can tie content to? Even if an anniversary of an event is not particularly related to your niche but there is broad awareness of it, can you nevertheless create some kind of tie-in with your content? Can you use your content to publicize an anniversary that people won’t otherwise be aware of, but that would be of interest to your marketplace and attract them to you? This can take some thought and preparation, but can be worth doing for the additional exposure it can bring you. Are there any developments coming up in your industry or that would be of interest to your marketplace that you can create content about? Such content can be used to pre-warn people or just make them aware prior to it actually happening. Alternatively, you can have content created and ready to be published as soon as it happens and potentially gain more exposure and publicity as a result. Podcasts are increasingly popular and can be a vital source of news, information, and expertise related to your niche. Subscribe to one or more such podcasts, and use them to inspire new blog content ideas, as well as build your own expertise and knowledgebase. Go to popular article directories like EzineArticles.com, and look for popular content topics related to your niche. Can you find ideas that work well as a blog post, or that you can improve and expand upon for your own marketplace? Read as many books as you can related to your industry. Make notes as you go along, including new ideas for your own content. Become the expert and the authority, and this will be reflected in your content. 36. Use your archives of notes. Go back through your archives of notes from webinars, conferences, teleconferences, hangouts, and more. You’ll likely find a ton of ideas for your own content. 37. What do you want to learn about? Creating content is also a vital source of learning for you, and as a natural consequence builds your own authority and expertise. It’s just another advantage of blogging regularly, if you’re creating the original content yourself. So with that in mind, what do you want to learn about? What do you wish you knew more about? Where are the gaps in your knowledge and expertise? Use this as an opportunity for your own learning as well as for creating useful content for your market. Research as necessary, take courses, find out as much as you can from different sources – and then pass on your new-found expertise via your own content. 38. Join social sharing communities. Join social sharing communities such as ViralContentBuzz and get ideas for your own content from the type of content that’s being shared with others and getting exposure. Believe it or not, the best ideas for other content often comes while you’re creating content. It’s when you’re in the ‘content creating zone’. You’ll come across points all the time for example that you could expand on but which don’t necessarily fit into the exact post you’re creating. So make a note for future. For example, create a draft blog post with a few brief ideas while it’s still fresh in your mind. It will then be ready and waiting for you the next time you need to create some content. It’s not just about creating content as in #39 above, it’s about creating content as regularly as possible. As a habit. The more content you create, the more ideas will flow. Strangely, the less content you create, the fewer ideas you’ll have for content. So those who create little content are almost by definition short of ideas. But as soon as you get into a regular content creation habit, you’ll find the ideas just flow and you’ll likely have more ideas than you can realistically use. The benefit is that you can then choose the best ideas and improve your output overall. 41. Join discussions on social platforms. Join discussions and conversations on Google+, Facebook and/or LinkedIn, depending on your market. Expand short comments you contribute into more fully-fledged content. 42. Don’t miss an idea. Ever. Ideas for content can come to you any time, so wherever you are and whatever you are doing, try to always have a way to take note of those ideas. Otherwise you’ll miss those fleeting, momentary moments of inspiration. Once gone, they’re gone forever. Use a smartphone and an app such as Evernote. Or call your home or business phone and leave a message for yourself. Or save an audio file. Find what works for you. Just don’t miss that next great idea! 43. Try the newbie approach. Don’t assume your audience has your level of expertise. Try showing your content in-person to someone who’s completely new or a novice, but who are interested. Note the questions they ask. What do they find unclear? What do you need to explain further? Make a list of content ideas that focus on the newbies in your market, and makes things clear for them. What one new thing have you learned or found out about this month that would also benefit your audience? Share your new-found expertise (and by doing so, reinforce your own learning), and you have another blog post for your market. Either by yourself or with a colleague or partner, give yourself ten minutes and list down as many ideas as you possibly can in that time frame. Just write everything down that comes to mind down. You can throw out the more unrealistic ideas later. The more ideas you put down, the more they’ll lead to other ideas, and then you can simply concentrate on the best ones you have for future posts. 46. Use the expertise already in your business. Get everyone, or the top players, in your business together. Ask them to contribute content ideas. Get together on a regular basis, e.g. weekly, and get them focused by insisting they contribute at least say one idea a week. Have some kind of prize, incentive or company recognition for ideas that are used – this will help both inspire and get them on board. Ask them to create some of the content too. Get everyone invested in and understanding the importance of content creation. 47. Have an idea box. Have an idea box in your business where employees can drop content ideas in anonymously (or not if they wish). This allows suggestions that people may not otherwise verbalize for fear of sounding stupid, as well as caters for those who suddenly come with an idea they want to contribute right away. As with #46 above, there could again be some kind of incentive or recognition for those contributing the best ideas. If you’re completely stumped by a blank, white page – which you shouldn’t be with all the ideas here! – just start writing about anything. It’s used by professional writers a lot, and it’s just as effective for business blogging purposes. You’ll be surprised what comes to mind as you get started. Try 750words.com to get into the writing habit. Reach out and connect with prospects and customers as often as possible. It’s even more powerful if you can do so personally, e.g. at events, or in the normal course of your business. Get their pulse, find out what their challenges are. 50. Go to events of related businesses. Play prospect at the events of related businesses. Other businesses and business owners often have very different perspectives, and it can inspire new ideas and approaches to communicating with customers. By playing prospect rather than say running your own event, your fellow attendees are more likely to relax and open up when you speak with them, and enable you to better understand the type of content that might serve them best. Keep metrics of your content and the engagement each piece of content attracted. For the most successful content, how can you do more of it. What type of content did best? What similar content can you create that might play into those same strengths? Search for some of your main keywords on Google and click through on some of the results, particularly the blog posts and other content. What do you agree/disagree with, love, or vehemently loathe? What content could you create as opinion pieces that could build your authority and help position you as a thought leader in your industry? How can you be controversial? Do you have opinions or strategies that go against the grain or the commonly perceived wisdom? Do you have success with a new or different approach? What topics can you create a list about? List articles do really well online, especially longer lists like this one, with increased search engine visibility and popularity on social media. For example, just try writing down blog titles like 10 top ways to ____ for topics related to your industry and see what you come up with. In relation to your niche, what one thing could someone do tomorrow that would improve their life or solve a particular struggle? Try writing down the top 10 challenges someone in your industry faces, and then the #1 solution for each one. That’s ten new pieces of content! 56. What mistakes are people making? 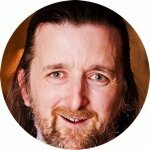 What mistakes do you see people make all the time that are related to your niche? Write down the top ten mistakes people make. For each one, how should they approach it differently? There’s another ten pieces of content for you! 57. Keep your eyes and ears open! Finally, as you get accustomed to coming up with new blog content ideas on a regular basis, you’ll find there’s inspiration and new content opportunities everywhere! So keep your eyes and ears open. The only limit is your imagination. With these 57 ways to quickly and easily generate new blog content ideas, you should never be short of an idea again. But only if you keep this list handy! 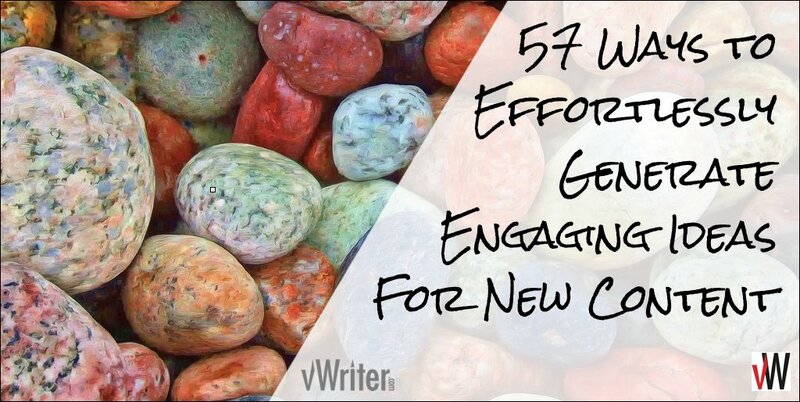 Don’t forget to get the checklist with 57 ways to generate ideas for new content. Very useful post. Thank you so much.